This chapter describes routines for performing least squares fits to experimental data using linear combinations of functions. The data may be weighted or unweighted, i.e. with known or unknown errors. For weighted data the functions compute the best fit parameters and their associated covariance matrix. For unweighted data the covariance matrix is estimated from the scatter of the points, giving a variance-covariance matrix. The functions are divided into separate versions for simple one- or two-parameter regression and multiple-parameter fits. The parameters of the model are . The weight factors are given by where is the experimental error on the data-point . The errors are assumed to be Gaussian and uncorrelated. For unweighted data the chi-squared sum is computed without any weight factors. where denotes an average over the Gaussian error distributions of the underlying datapoints. When computing the covariance matrix for unweighted data, i.e. data with unknown errors, the weight factors in this sum are replaced by the single estimate , where is the computed variance of the residuals about the best-fit model, . This is referred to as the variance-covariance matrix. The standard deviations of the best-fit parameters are given by the square root of the corresponding diagonal elements of the covariance matrix, . 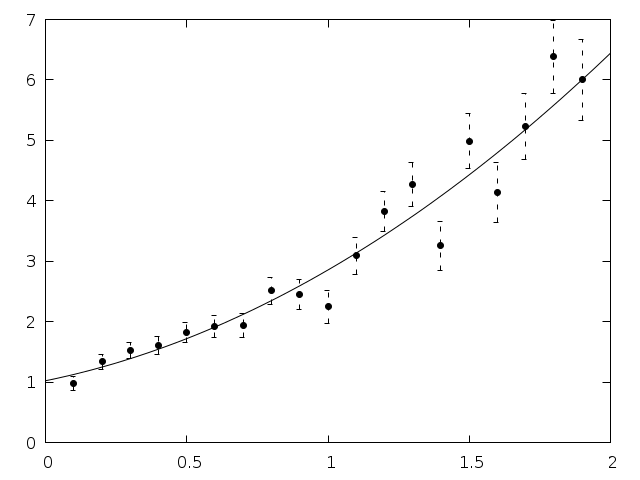 The correlation coefficient of the fit parameters and is given by . The functions in this section are used to fit simple one or two parameter linear regression models. The functions are declared in the header file gsl_fit.h. The functions described in this section can be used to perform least-squares fits to a straight line model, . This function computes the best-fit linear regression coefficients (c0, c1) of the model for the dataset (x, y), two vectors of length n with strides xstride and ystride. The errors on y are assumed unknown so the variance-covariance matrix for the parameters (c0, c1) is estimated from the scatter of the points around the best-fit line and returned via the parameters (cov00, cov01, cov11). The sum of squares of the residuals from the best-fit line is returned in sumsq. Note: the correlation coefficient of the data can be computed using gsl_stats_correlation(), it does not depend on the fit. This function computes the best-fit linear regression coefficients (c0, c1) of the model for the weighted dataset (x, y), two vectors of length n with strides xstride and ystride. The vector w, of length n and stride wstride, specifies the weight of each datapoint. The weight is the reciprocal of the variance for each datapoint in y. The covariance matrix for the parameters (c0, c1) is computed using the weights and returned via the parameters (cov00, cov01, cov11). The weighted sum of squares of the residuals from the best-fit line, , is returned in chisq. This function uses the best-fit linear regression coefficients c0, c1 and their covariance cov00, cov01, cov11 to compute the fitted function y and its standard deviation y_err for the model at the point x. The functions described in this section can be used to perform least-squares fits to a straight line model without a constant term, . This function computes the best-fit linear regression coefficient c1 of the model for the datasets (x, y), two vectors of length n with strides xstride and ystride. The errors on y are assumed unknown so the variance of the parameter c1 is estimated from the scatter of the points around the best-fit line and returned via the parameter cov11. The sum of squares of the residuals from the best-fit line is returned in sumsq. This function computes the best-fit linear regression coefficient c1 of the model for the weighted datasets (x, y), two vectors of length n with strides xstride and ystride. The vector w, of length n and stride wstride, specifies the weight of each datapoint. The weight is the reciprocal of the variance for each datapoint in y. The variance of the parameter c1 is computed using the weights and returned via the parameter cov11. The weighted sum of squares of the residuals from the best-fit line, , is returned in chisq. This function uses the best-fit linear regression coefficient c1 and its covariance cov11 to compute the fitted function y and its standard deviation y_err for the model at the point x.
where is a vector of observations, is an -by- matrix of predictor variables, is a vector of the unknown best-fit parameters to be estimated, and . The matrix defines the weights or uncertainties of the observation vector. where the index runs over the observations and the index runs from 0 to . where is the -th value of the predictor variable . The solution of the general linear least-squares system requires an additional working space for intermediate results, such as the singular value decomposition of the matrix . These functions are declared in the header file gsl_multifit.h. This workspace contains internal variables for fitting multi-parameter models. This function allocates a workspace for fitting a model to a maximum of n observations using a maximum of p parameters. The user may later supply a smaller least squares system if desired. The size of the workspace is . This function frees the memory associated with the workspace w.
This function performs a singular value decomposition of the matrix X and stores the SVD factors internally in work. This function performs a singular value decomposition of the matrix X and stores the SVD factors internally in work. The matrix X is first balanced by applying column scaling factors to improve the accuracy of the singular values. This function computes the best-fit parameters c of the model for the observations y and the matrix of predictor variables X, using the preallocated workspace provided in work. The -by- variance-covariance matrix of the model parameters cov is set to , where is the standard deviation of the fit residuals. The sum of squares of the residuals from the best-fit, , is returned in chisq. If the coefficient of determination is desired, it can be computed from the expression , where the total sum of squares (TSS) of the observations y may be computed from gsl_stats_tss(). The best-fit is found by singular value decomposition of the matrix X using the modified Golub-Reinsch SVD algorithm, with column scaling to improve the accuracy of the singular values. Any components which have zero singular value (to machine precision) are discarded from the fit. This function computes the best-fit parameters c of the model for the observations y and the matrix of predictor variables X, using a truncated SVD expansion. Singular values which satisfy are discarded from the fit, where is the largest singular value. The -by- variance-covariance matrix of the model parameters cov is set to , where is the standard deviation of the fit residuals. The sum of squares of the residuals from the best-fit, , is returned in chisq. The effective rank (number of singular values used in solution) is returned in rank. If the coefficient of determination is desired, it can be computed from the expression , where the total sum of squares (TSS) of the observations y may be computed from gsl_stats_tss(). This function computes the best-fit parameters c of the weighted model for the observations y with weights w and the matrix of predictor variables X, using the preallocated workspace provided in work. The -by- covariance matrix of the model parameters cov is computed as . The weighted sum of squares of the residuals from the best-fit, , is returned in chisq. If the coefficient of determination is desired, it can be computed from the expression , where the weighted total sum of squares (WTSS) of the observations y may be computed from gsl_stats_wtss(). This function computes the best-fit parameters c of the weighted model for the observations y with weights w and the matrix of predictor variables X, using a truncated SVD expansion. Singular values which satisfy are discarded from the fit, where is the largest singular value. The -by- covariance matrix of the model parameters cov is computed as . The weighted sum of squares of the residuals from the best-fit, , is returned in chisq. The effective rank of the system (number of singular values used in the solution) is returned in rank. If the coefficient of determination is desired, it can be computed from the expression , where the weighted total sum of squares (WTSS) of the observations y may be computed from gsl_stats_wtss(). This function uses the best-fit multilinear regression coefficients c and their covariance matrix cov to compute the fitted function value y and its standard deviation y_err for the model at the point x. This function computes the vector of residuals for the observations y, coefficients c and matrix of predictor variables X. This function returns the rank of the matrix which must first have its singular value decomposition computed. The rank is computed by counting the number of singular values which satisfy , where is the largest singular value. to achieve the standard form. For a rectangular matrix with , a more sophisticated approach is needed (see Hansen 1998, chapter 2.3). In practice, the normal equations solution above is not desirable due to numerical instabilities, and so the system is solved using the singular value decomposition of the matrix . The matrix is often chosen as the identity matrix, or as a first or second finite difference operator, to ensure a smoothly varying coefficient vector , or as a diagonal matrix to selectively damp each model parameter differently. If , the user must first convert the least squares problem to standard form using gsl_multifit_linear_stdform1() or gsl_multifit_linear_stdform2(), solve the system, and then backtransform the solution vector to recover the solution of the original problem (see gsl_multifit_linear_genform1() and gsl_multifit_linear_genform2()). In many regularization problems, care must be taken when choosing the regularization parameter . Since both the residual norm and solution norm are being minimized, the parameter represents a tradeoff between minimizing either the residuals or the solution vector. A common tool for visualizing the comprimise between the minimization of these two quantities is known as the L-curve. The L-curve is a log-log plot of the residual norm on the horizontal axis and the solution norm on the vertical axis. This curve nearly always as an shaped appearance, with a distinct corner separating the horizontal and vertical sections of the curve. The regularization parameter corresponding to this corner is often chosen as the optimal value. 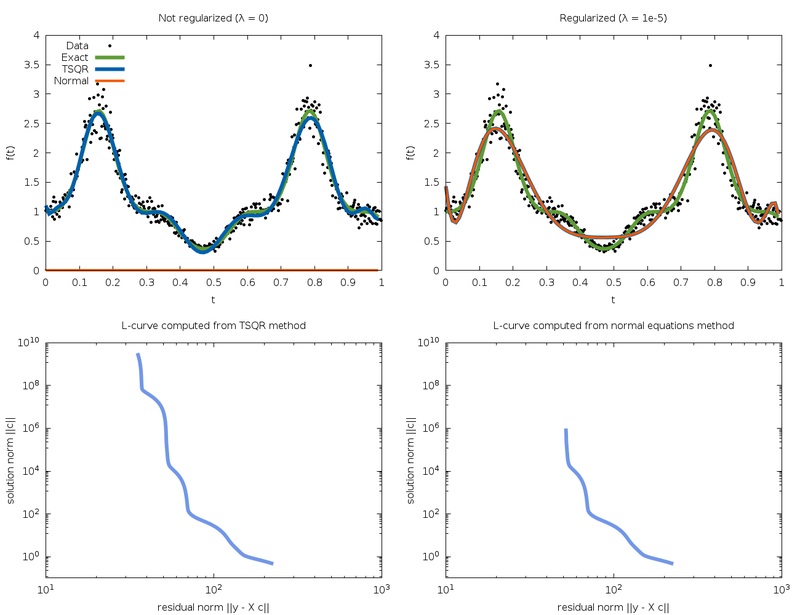 GSL provides routines to calculate the L-curve for all relevant regularization parameters as well as locating the corner. where is the matrix which relates the solution to the right hand side , ie: . GSL provides routines to compute the GCV curve and its minimum. Transform the system to standard form ( , ). This step can be skipped if and . Calculate the SVD of . Determine an appropriate regularization parameter (using for example L-curve or GCV analysis). Solve the standard form system using the chosen and the SVD of . Backtransform the standard form solution to recover the original solution vector . These functions define a regularization matrix . The diagonal matrix element is provided by the -th element of the input vector L. The -by- least squares matrix X and vector y of length are then converted to standard form as described above and the parameters ( , ) are stored in Xs and ys on output. Xs and ys have the same dimensions as X and y. Optional data weights may be supplied in the vector w of length . In order to apply this transformation, must exist and so none of the may be zero. After the standard form system has been solved, use gsl_multifit_linear_genform1() to recover the original solution vector. It is allowed to have X = Xs and y = ys for an in-place transform. In order to perform a weighted regularized fit with , the user may call gsl_multifit_linear_applyW() to convert to standard form. This function factors the -by- regularization matrix L into a form needed for the later transformation to standard form. L may have any number of rows . If the QR decomposition of L is computed and stored in L on output. If , the QR decomposition of is computed and stored in L on output. On output, the Householder scalars are stored in the vector tau of size . These outputs will be used by gsl_multifit_linear_wstdform2() to complete the transformation to standard form. These functions convert the least squares system (X, y, W, ) to standard form ( , ) which are stored in Xs and ys respectively. The -by- regularization matrix L is specified by the inputs LQR and Ltau, which are outputs from gsl_multifit_linear_L_decomp(). The dimensions of the standard form parameters ( , ) depend on whether is larger or less than . For , Xs is -by- , ys is -by-1, and M is not used. For , Xs is -by- , ys is -by-1, and M is additional -by- workspace, which is required to recover the original solution vector after the system has been solved (see gsl_multifit_linear_genform2()). Optional data weights may be supplied in the vector w of length , where . This function computes the regularized best-fit parameters which minimize the cost function which is in standard form. The least squares system must therefore be converted to standard form prior to calling this function. The observation vector is provided in ys and the matrix of predictor variables in Xs. The solution vector is returned in cs, which has length min( ). The SVD of Xs must be computed prior to calling this function, using gsl_multifit_linear_svd(). The regularization parameter is provided in lambda. The residual norm is returned in rnorm. The solution norm is returned in snorm. After a regularized system has been solved with , this function backtransforms the standard form solution vector cs to recover the solution vector of the original problem c. The diagonal matrix elements are provided in the vector L. It is allowed to have c = cs for an in-place transform. After a regularized system has been solved with a general rectangular matrix , specified by (LQR, Ltau), this function backtransforms the standard form solution cs to recover the solution vector of the original problem, which is stored in c, of length . The original least squares matrix and observation vector are provided in X and y respectively. M is the matrix computed by gsl_multifit_linear_stdform2(). For weighted fits, the weight vector w must also be supplied. For weighted least squares systems with , this function may be used to convert the system to standard form by applying the weight matrix to the least squares matrix X and observation vector y. On output, WX is equal to and Wy is equal to . It is allowed for WX = X and Wy = y for an in-place transform. This function computes the L-curve for a least squares system using the right hand side vector y and the SVD decomposition of the least squares matrix X, which must be provided to gsl_multifit_linear_svd() prior to calling this function. The output vectors reg_param, rho, and eta must all be the same size, and will contain the regularization parameters , residual norms , and solution norms which compose the L-curve, where is the regularized solution vector corresponding to . The user may determine the number of points on the L-curve by adjusting the size of these input arrays. The regularization parameters are estimated from the singular values of X, and chosen to represent the most relevant portion of the L-curve. This function attempts to locate the corner of the L-curve defined by the rho and eta input arrays respectively. The corner is defined as the point of maximum curvature of the L-curve in log-log scale. The rho and eta arrays can be outputs of gsl_multifit_linear_lcurve(). The algorithm used simply fits a circle to 3 consecutive points on the L-curve and uses the circle’s radius to determine the curvature at the middle point. Therefore, the input array sizes must be . With more points provided for the L-curve, a better estimate of the curvature can be obtained. The array index corresponding to maximum curvature (ie: the corner) is returned in idx. If the input arrays contain colinear points, this function could fail and return GSL_EINVAL. This function attempts to locate the corner of an alternate L-curve studied by Rezghi and Hosseini, 2009. This alternate L-curve can provide better estimates of the regularization parameter for smooth solution vectors. The regularization parameters and solution norms are provided in the reg_param and eta input arrays respectively. The corner is defined as the point of maximum curvature of this alternate L-curve in linear scale. The reg_param and eta arrays can be outputs of gsl_multifit_linear_lcurve(). The algorithm used simply fits a circle to 3 consecutive points on the L-curve and uses the circle’s radius to determine the curvature at the middle point. Therefore, the input array sizes must be . With more points provided for the L-curve, a better estimate of the curvature can be obtained. The array index corresponding to maximum curvature (ie: the corner) is returned in idx. If the input arrays contain colinear points, this function could fail and return GSL_EINVAL. This function performs some initialization in preparation for computing the GCV curve and its minimum. The right hand side vector is provided in y. On output, reg_param is set to a vector of regularization parameters in decreasing order and may be of any size. The vector UTy of size is set to . The parameter delta0 is needed for subsequent steps of the GCV calculation. This funtion calculates the GCV curve and stores it in G on output, which must be the same size as reg_param. The inputs reg_param, UTy and delta0 are computed in gsl_multifit_linear_gcv_init(). This function computes the value of the regularization parameter which minimizes the GCV curve and stores it in lambda. The input G is calculated by gsl_multifit_linear_gcv_curve() and the inputs reg_param, UTy and delta0 are computed by gsl_multifit_linear_gcv_init(). This function returns the value of the GCV curve corresponding to the input lambda. This function combines the steps gcv_init, gcv_curve, and gcv_min defined above into a single function. The input y is the right hand side vector. On output, reg_param and G, which must be the same size, are set to vectors of and values respectively. The output lambda is set to the optimal value of which minimizes the GCV curve. The minimum value of the GCV curve is returned in G_lambda. This function computes the discrete approximation to the derivative operator of order k on a regular grid of p points and stores it in L. The dimensions of L are -by- . This function computes the regularization matrix L corresponding to the weighted Sobolov norm where approximates the derivative operator of order . This regularization norm can be useful in applications where it is necessary to smooth several derivatives of the solution. p is the number of model parameters, kmax is the highest derivative to include in the summation above, and alpha is the vector of weights of size kmax + 1, where alpha[k] = is the weight assigned to the derivative of order . The output matrix L is size p-by-p and upper triangular. This function returns the reciprocal condition number of the least squares matrix , defined as the ratio of the smallest and largest singular values, rcond = . The routine gsl_multifit_linear_svd() must first be called to compute the SVD of . This system of equations is equivalent to solving a weighted ordinary least squares problem, minimizing . The weights however, depend on the residuals , which depend on the coefficients , which depend on the weights. Therefore, an iterative solution is used, called Iteratively Reweighted Least Squares (IRLS). For iteration , form the residuals , where is a tuning constant depending on the choice of , and are the statistical leverages (diagonal elements of the matrix ). Including and in the residual calculation has been shown to improve the convergence of the method. The residual standard deviation is approximated as , where MAD is the Median-Absolute-Deviation of the largest residuals from the previous iteration. Compute new coefficients by solving the weighted least squares problem with weights . for all where is a small tolerance factor. The key to this method lies in selecting the function to assign smaller weights to large residuals, and larger weights to smaller residuals. As the iteration proceeds, outliers are assigned smaller and smaller weights, eventually having very little or no effect on the fitted model. This workspace is used for robust least squares fitting. This function allocates a workspace for fitting a model to n observations using p parameters. The size of the workspace is . The type T specifies the function and can be selected from the following choices. This specifies the gsl_multifit_robust_bisquare type (see below) and is a good general purpose choice for robust regression. and the default tuning constant is . This function returns the name of the robust type T specified to gsl_multifit_robust_alloc(). This function sets the tuning constant used to adjust the residuals at each iteration to tune. Decreasing the tuning constant increases the downweight assigned to large residuals, while increasing the tuning constant decreases the downweight assigned to large residuals. This function sets the maximum number of iterations in the iteratively reweighted least squares algorithm to maxiter. By default, this value is set to 100 by gsl_multifit_robust_alloc(). This function assigns weights to the vector wts using the residual vector r and previously specified weighting function. The output weights are given by , where the weighting functions are detailed in gsl_multifit_robust_alloc(). is an estimate of the residual standard deviation based on the Median-Absolute-Deviation and is the tuning constant. This function is useful if the user wishes to implement their own robust regression rather than using the supplied gsl_multifit_robust() routine below. This function computes the best-fit parameters c of the model for the observations y and the matrix of predictor variables X, attemping to reduce the influence of outliers using the algorithm outlined above. The -by- variance-covariance matrix of the model parameters cov is estimated as , where is an approximation of the residual standard deviation using the theory of robust regression. Special care must be taken when estimating and other statistics such as , and so these are computed internally and are available by calling the function gsl_multifit_robust_statistics(). If the coefficients do not converge within the maximum iteration limit, the function returns GSL_EMAXITER. In this case, the current estimates of the coefficients and covariance matrix are returned in c and cov and the internal fit statistics are computed with these estimates. This function uses the best-fit robust regression coefficients c and their covariance matrix cov to compute the fitted function value y and its standard deviation y_err for the model at the point x. This function computes the vector of studentized residuals for the observations y, coefficients c and matrix of predictor variables X. The routine gsl_multifit_robust() must first be called to compute the statisical leverages of the matrix X and residual standard deviation estimate . This function returns a structure containing relevant statistics from a robust regression. The function gsl_multifit_robust() must be called first to perform the regression and calculate these statistics. The returned gsl_multifit_robust_stats structure contains the following fields. This contains the standard deviation of the residuals as computed from ordinary least squares (OLS). This contains an estimate of the standard deviation of the final residuals from the theory of robust regression (see Street et al, 1988). This contains an estimate of the standard deviation of the final residuals by attemping to reconcile sigma_rob and sigma_ols in a reasonable way. This contains the coefficient of determination statistic using the estimate sigma. This contains the adjusted coefficient of determination statistic using the estimate sigma. This contains the residual sum of squares taking into account the robust covariance matrix. and we will drop the tilde characters from the various parameters. For a discussion of the transformation to standard form, see Regularized regression. into blocks, where each block ( ) may have any number of rows, but each has columns. The sections below describe the methods available for solving this partitioned system. The functions are declared in the header file gsl_multilarge.h. Since the matrix is symmetric, only half of it needs to be calculated. Once all of the blocks have been accumulated into the final and , the system can be solved with a Cholesky factorization of the matrix. The matrix is first transformed via a diagonal scaling transformation to attempt to reduce its condition number as much as possible to recover a more accurate solution vector. The normal equations approach is the fastest method for solving the large least squares problem, and is accurate for well-conditioned matrices . However, for ill-conditioned matrices, as is often the case for large systems, this method can suffer from numerical instabilities (see Trefethen and Bau, 1997). The number of operations for this method is . This QR decomposition is done efficiently taking into account the sparse structure of . See Demmel et al, 2008 for more details on how this is accomplished. The number of operations for this method is . Choose the regularization matrix . Construct a block of rows of the least squares matrix, right hand side vector, and weight vector ( , , ). Transform the block to standard form ( , ). This step can be skipped if and . Accumulate the standard form block ( , ) into the system. Repeat steps 2-4 until the entire matrix and right hand side vector have been accumulated. Determine an appropriate regularization parameter (using for example L-curve analysis). Solve the standard form system using the chosen . This workspace contains parameters for solving large linear least squares problems. This function allocates a workspace for solving large linear least squares systems. The least squares matrix has p columns, but may have any number of rows. This specifies the normal equations approach for solving the least squares system. This method is suitable in cases where performance is critical and it is known that the least squares matrix is well conditioned. The size of this workspace is . This specifies the sequential Tall Skinny QR (TSQR) approach for solving the least squares system. This method is a good general purpose choice for large systems, but requires about twice as many operations as the normal equations method for . The size of this workspace is . This function returns a string pointer to the name of the multilarge solver. This function resets the workspace w so it can begin to accumulate a new least squares system. These functions define a regularization matrix . The diagonal matrix element is provided by the -th element of the input vector L. The block (X, y) is converted to standard form and the parameters ( , ) are stored in Xs and ys on output. Xs and ys have the same dimensions as X and y. Optional data weights may be supplied in the vector w. In order to apply this transformation, must exist and so none of the may be zero. After the standard form system has been solved, use gsl_multilarge_linear_genform1() to recover the original solution vector. It is allowed to have X = Xs and y = ys for an in-place transform. This function calculates the QR decomposition of the -by- regularization matrix L. L must have . On output, the Householder scalars are stored in the vector tau of size . These outputs will be used by gsl_multilarge_linear_wstdform2() to complete the transformation to standard form. These functions convert a block of rows (X, y, w) to standard form ( , ) which are stored in Xs and ys respectively. X, y, and w must all have the same number of rows. The -by- regularization matrix L is specified by the inputs LQR and Ltau, which are outputs from gsl_multilarge_linear_L_decomp(). Xs and ys have the same dimensions as X and y. After the standard form system has been solved, use gsl_multilarge_linear_genform2() to recover the original solution vector. Optional data weights may be supplied in the vector w, where . This function accumulates the standard form block ( ) into the current least squares system. X and y have the same number of rows, which can be arbitrary. X must have columns. For the TSQR method, X and y are destroyed on output. For the normal equations method, they are both unchanged. After all blocks ( ) have been accumulated into the large least squares system, this function will compute the solution vector which is stored in c on output. The regularization parameter is provided in lambda. On output, rnorm contains the residual norm and snorm contains the solution norm . After a regularized system has been solved with a regularization matrix , specified by (LQR, Ltau), this function backtransforms the standard form solution cs to recover the solution vector of the original problem, which is stored in c, of length . This function computes the L-curve for a large least squares system after it has been fully accumulated into the workspace work. The output vectors reg_param, rho, and eta must all be the same size, and will contain the regularization parameters , residual norms , and solution norms which compose the L-curve, where is the regularized solution vector corresponding to . The user may determine the number of points on the L-curve by adjusting the size of these input arrays. For the TSQR method, the regularization parameters are estimated from the singular values of the triangular factor. For the normal equations method, they are estimated from the eigenvalues of the matrix. This function computes the reciprocal condition number, stored in rcond, of the least squares matrix after it has been accumulated into the workspace work. For the TSQR algorithm, this is accomplished by calculating the SVD of the factor, which has the same singular values as the matrix . For the normal equations method, this is done by computing the eigenvalues of , which could be inaccurate for ill-conditioned matrices . and then construct the matrix using the transformed values . The example programs in this section demonstrate the various linear regression methods. The following program computes a least squares straight-line fit to a simple dataset, and outputs the best-fit line and its associated one standard-deviation error bars. The result is shown in Fig. 29.
where the column of ones corresponds to the constant term . The two remaining columns corresponds to the terms and . The program reads n lines of data in the format (x, y, err) where err is the error (standard deviation) in the value y. A suitable set of data for fitting can be generated using the following program. It outputs a set of points with gaussian errors from the curve in the region . The parameters of the quadratic fit match the coefficients of the expansion of , taking into account the errors on the parameters and the difference between the exponential and quadratic functions for the larger values of . The errors on the parameters are given by the square-root of the corresponding diagonal elements of the covariance matrix. The chi-squared per degree of freedom is 1.4, indicating a reasonable fit to the data. Fig. 30 shows the resulting fit. The next program demonstrates the difference between ordinary and regularized least squares when the design matrix is near-singular. In this program, we generate two random normally distributed variables and , with so that and are nearly colinear. We then set a third dependent variable and solve for the coefficients of the model . Since , the design matrix is nearly singular, leading to unstable ordinary least squares solutions. We see that the ordinary least squares solution is completely wrong, while the L-curve regularized method with the optimal finds the correct solution . The GCV regularized method finds a regularization parameter which is too small to give an accurate solution, although it performs better than OLS. The L-curve and its computed corner, as well as the GCV curve and its minimum are plotted in Fig. 31. Fig. 31 L-curve and GCV curve for example program. The program is given below. and the right hand side vector is given by . Solutions are computed for (unregularized) as well as for optimal parameters chosen by analyzing the L-curve and GCV curve. Here we see the unregularized solution results in a large solution norm due to the ill-conditioned matrix. The L-curve solution finds a small value of which still results in a badly conditioned system and a large solution norm. The GCV method finds a parameter which results in a well-conditioned system and small solution norm. The L-curve and its computed corner, as well as the GCV curve and its minimum are plotted in Fig. 32. Fig. 32 L-curve and GCV curve for example program. The next program demonstrates the advantage of robust least squares on a dataset with outliers. The program generates linear data pairs on the line , adds some random noise, and inserts 3 outliers into the dataset. 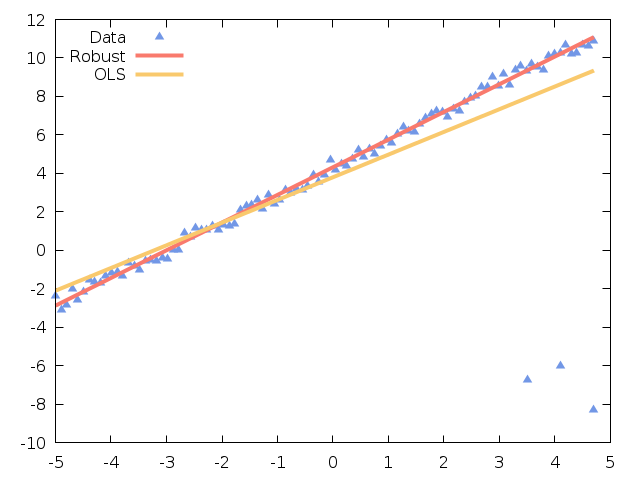 Both the robust and ordinary least squares (OLS) coefficients are computed for comparison. The output from the program is shown in Fig. 33. Fig. 33 Linear fit to dataset with outliers. The following program demostrates the large dense linear least squares solvers. This example is adapted from Trefethen and Bau, and fits the function on the interval with a degree 15 polynomial. The program generates equally spaced points on this interval, calculates the function value and adds random noise to determine the observation value . The entries of the least squares matrix are , representing a polynomial fit. The matrix is highly ill-conditioned, with a condition number of about . The program accumulates the matrix into the least squares system in 5 blocks, each with 10000 rows. This way the full matrix is never stored in memory. We solve the system with both the normal equations and TSQR methods. The results are shown in Fig. 34. In the top left plot, we see the unregularized normal equations solution has larger error than TSQR due to the ill-conditioning of the matrix. In the bottom left plot, we show the L-curve, which exhibits multiple corners. In the top right panel, we plot a regularized solution using . The TSQR and normal solutions now agree, however they are unable to provide a good fit due to the damping. This indicates that for some ill-conditioned problems, regularizing the normal equations does not improve the solution. This is further illustrated in the bottom right panel, where we plot the L-curve calculated from the normal equations. The curve agrees with the TSQR curve for larger damping parameters, but for small , the normal equations approach cannot provide accurate solution vectors leading to numerical inaccuracies in the left portion of the curve. The Review of Particle Physics is available online at the website given above. 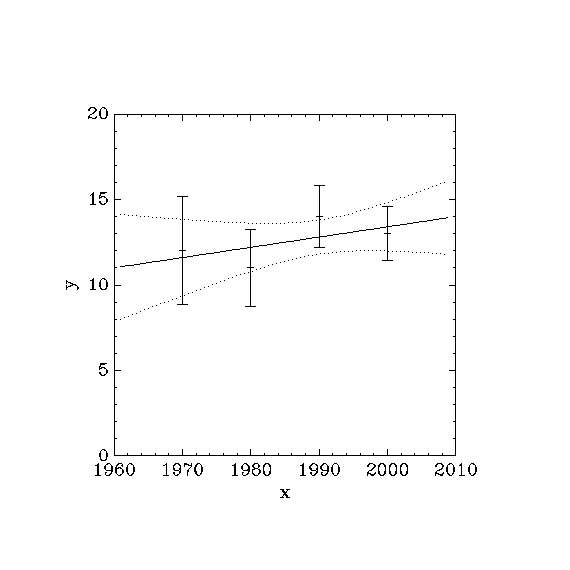 M. Rezghi and S. M. Hosseini (2009), A new variant of L-curve for Tikhonov regularization, Journal of Computational and Applied Mathematics, Volume 231, Issue 2, pages 914-924. Street, J.O., R.J. Carroll, and D. Ruppert (1988), “A note on computing robust regression estimates via iteratively reweighted least squares,” The American Statistician, v. 42, pp. 152-154. Trefethen, L. N. and Bau, D. (1997), “Numerical Linear Algebra”, SIAM. Demmel, J., Grigori, L., Hoemmen, M. F., and Langou, J. “Communication-optimal parallel and sequential QR and LU factorizations”, UCB Technical Report No. UCB/EECS-2008-89, 2008. © Copyright 1996-2018 The GSL Team.